Hi ” everyone! I want to thank Jessica @ Writing Pearls for allowing me to take over her blog today! I am so excited to be here to talk about my brand new Etsy shop, Bookish Serendipity Co. At Bookish Serendipity Co, you can find affordable handmade bookish jewelry and accessories. All items are hand-crafted by me in my home studio. I’m running a blog tour to share the news of the shop launch. Throughout this tour, I’ve spent a lot of time chatting about Bookish Serendipity Co, and I’ve loved every minute of it. Today, however, I’m going to try something different: I’m going to talk about some book-related items from other Etsy stores that I love! This is another Etsy shop that is run by a blogger. 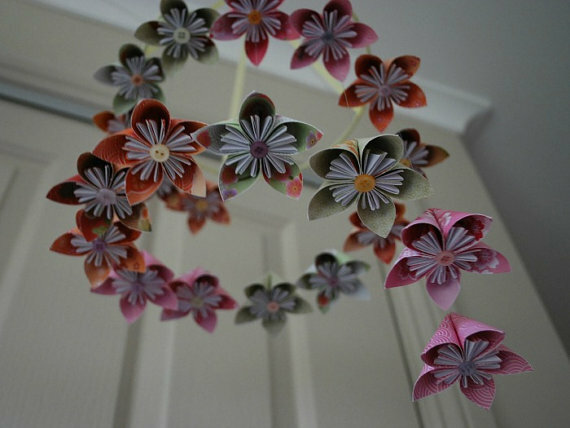 Cait @ Paper Fury sells handmade origami decorations, often made from the pages of old books! Seriously, how cool is that? The one pictures above is a baby mobile, but I would totally hang this in my own room. I love all the different patterns and the color scheme is just gorgeous. This is my new favorite thing! 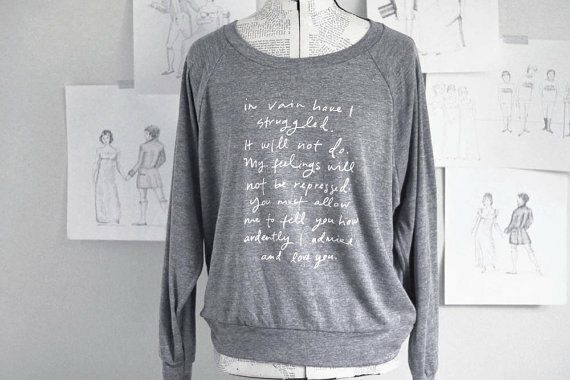 I absolutely adore bookish clothing items, and this slouchy sweatshirt is just too cute. I personally haven’t read anything by Jane Austen, but I really love the quote on the front. Plus, it looks so comfortable! 4. 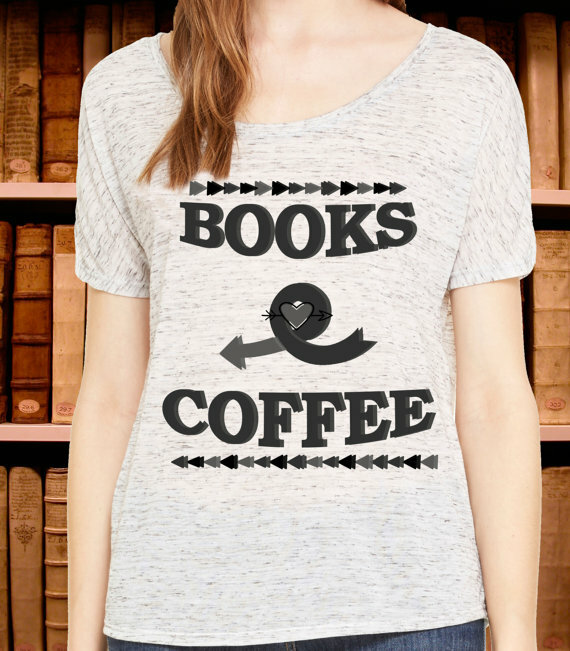 Books and Coffee-Slouchy Tee- Bookworm from GeekedOutThreads. 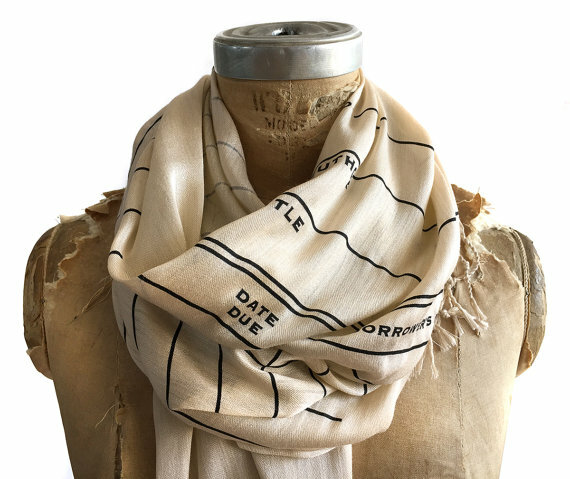 This is another bookish clothing item that is absolutely perfect! This t-shirt is so adorable. I could definitely picture myself wearing it–I definitely need to buy one of these t-shirts soon, clearly. I really like typography, and this t-shirt has such cute fonts! Love it. At Bookish Serendipity Co, you can find a variety of jewelry pieces and accessories inspired by books thatare both affordable and beautiful. Bookish Serendipity Co is run by me, a teen blogger and entrepreneur. All pieces are handmade for you, perfect for everyday wear. Looking to share your passion for books with the world? Bookish Serendipity Co is for you. Jessica is a reader, blogger, and entrepreneur. She runs the store Bookish Serendipity Co. on Etsy, where she sells affordable literary-inspired jewelry and accessories for book lovers. Jessica lives in Canada with her family, dog, and a never-ending TBR pile. At Bookish Serendipity Co, you can find a variety of jewelry pieces and accessories inspired by books that are both affordable and beautiful. 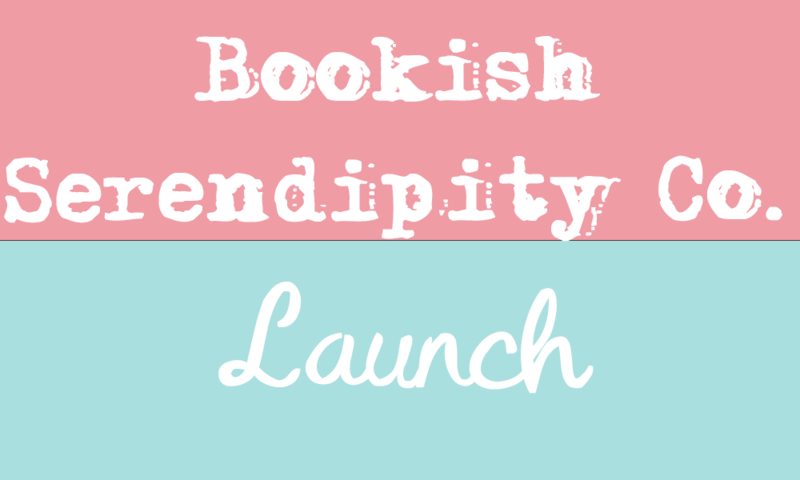 Bookish Serendipity Co is run by me, a teen blogger and entrepreneur. All pieces are handmade for you, perfect for everyday wear. Looking to share your passion for books with the world? Bookish Serendipity Co is for you.